During November 2007–January 2008, an archaeological survey was conducted in the region of Mount Scopus (Permit No. A-5228; map ref. 23800–4600/632800–3625). The survey, undertaken on behalf of the Israel Antiquities Authority, in cooperation with the Nature Preservation Authority and underwritten by the latter, was directed by A. Eirikh-Rose (photography, GPS), with the assistance of Y. Kagan (photography, GPS), D. Levy (editing GPS files), V. Avrutis and K. Masarwa. The survey concentrated in three main areas: the northern area (I), which extends south of ‘Issawiya village; the southern area (II), north of e-Tur village; and Area III, the site of Ras Tammim, which is situated on a hill above the wadi that separates the two villages (A. Kloner, 2000. Survey of Jerusalem: The Northeastern Sector, Site 310). Caves (including burial caves), rock-cuttings, cisterns and numerous other sites were documented. The survey area (c. 200 dunams) extended along the eastern slopes of the Mount Scopus ridge, the northern slope of the Mount of Olives and the ravine between them (Fig. 1). The Ma’ale Adumia road–Mount Scopus tunnel crosses through the area today. The hill on which Ras Tammim is located rises above the ravine at the foot of the ridge. The Mount Scopus and Mount of Olive ridges are composed of marine sedimentary rock of the Mount Scopus Group. The qirton rock is soft and very easily quarried; therefore, it was preferred to use these ridges for quarrying burial caves and building stones in ancient times. The slopes are steep and eroded of soil, hence, unsuitable for cultivation. Farming in the region was concentrated in the central ravine, across which several dams were built. The area was surveyed during the British Mandate and photographs of tombs and the site at Ras Tammim are on file in the Mandatory Department of Antiquities archive, in the Israel Antiquities Authority (Folders 110, 154). The Ras Tammim site was surveyed by Abel (F.M. Abel, 1933–1938, Géographie de la Palestine, II: 260. Paris) and as part of the Jerusalem survey project (A. Kloner, 2000. Survey of Jerusalem: the Northeastern Sector, Site 310); it has been identified with the biblical site of Bahurim (Samuel II 3:16, 16:5, 17:18, 19:16; Kings I 2:8). The identification is based, among other things, on the chronicles of the pilgrim Antoninus Placentinus (Antoninus Placentinus Itinerarium, Ch. 16) who stated that ‘Baorin’ is located alongside the road from Jericho to Jerusalem, which passed through the Mount of Olives. This identification is further corroborated by remains dating to the Iron Age that were found on the hill (E. E. Voigt. 1923–1924. Bahurim. AASOR 5:67–76). Five sites were exposed in salvage excavations, conducted in 1999–2000 on the northern and eastern slopes of the Augusta Victoria ridge: a road station from the Iron Age (Permit No. A-3114), a subterranean complex dating to the Persian period, a building-stone quarry and an underground quarry that included a workshop for the production of stone vessels, dating to the time of the Second Temple (D. Amit, J. Seligman and I. Zilberbod, 2001, A Quarry and Workshop for Producing Stone Vessels on the Slope of Mount Scopus, Qadmoniot 122:102–110) and the Monastery of Theodorus and Cyricus, which also served as a hostel for pilgrims during the Byzantine and Early Islamic periods (D. Amit, J. Seligman and I. Zilberbod, 2003. The Monastery of Theodorus and Cyricus on the Eastern Slope of Mount Scopus, Jerusalem. In G.C. Bottini, L. Di Segni and L.D. Chupcala, eds. One Land-Many Cultures: Archeological Studies in Honour of S. Loffreda. Jerusalem. Pp. 139–148). This is an extensive area that stretches across the precipitous eastern slope of Mount Scopus, south of ‘Issawiya village. 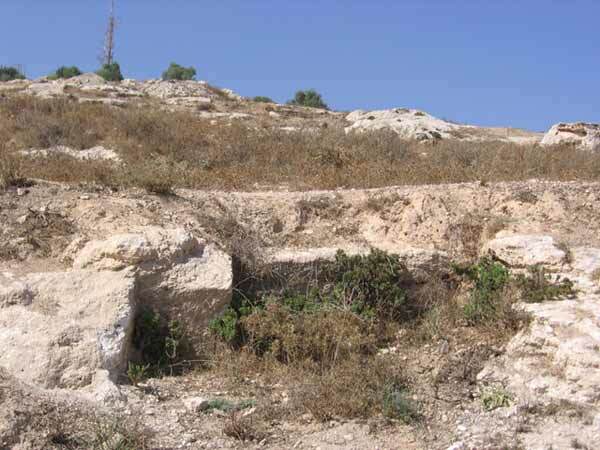 Several burial caves hewn in the slopes around Mount Scopus were described in the past by inspectors of the Mandatory Department of Antiquities (Folder 110). 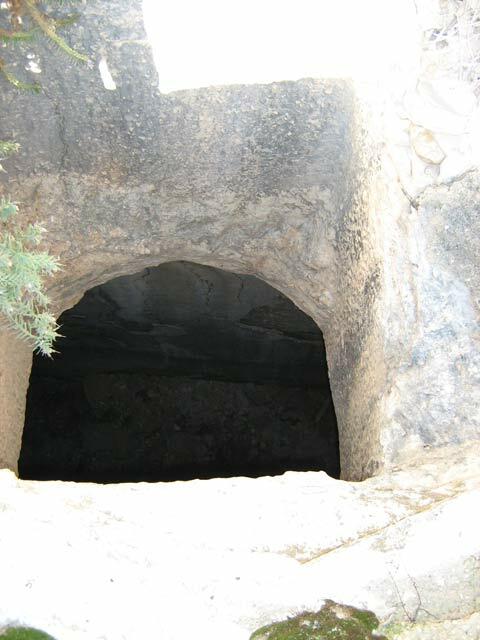 Burial caves that dated to the Second Temple period were discovered in the Survey of Jerusalem (A. Kloner, 2000, Sites 303, 304). These tombs were part of the Jerusalem necropolis during this period. 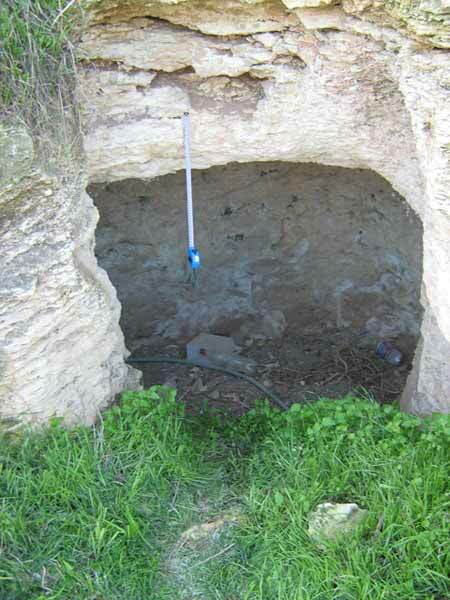 Several of the tombs from the ancient cemetery on the Mount Scopus ridge were excavated in the past, the most famous being Nicanor’s Cave in the botanical garden of the Hebrew University (A. Kloner, 2000, Site 293). Forty-five sites, scattered very densely throughout the area, were surveyed. Numerous potsherds, mostly dating to the Early Roman and Byzantine periods, were found on the surface. Caves. Seventeen burial caves were documented (Sites 1–3, 5, 6, 11, 12, 14, 15, 17, 19 [Fig. 2], 25, 26, 28, 34, 36, 40). Some of the caves were destroyed as a result of rock erosion; however, in most of them were remains of rectangular and hewn openings. 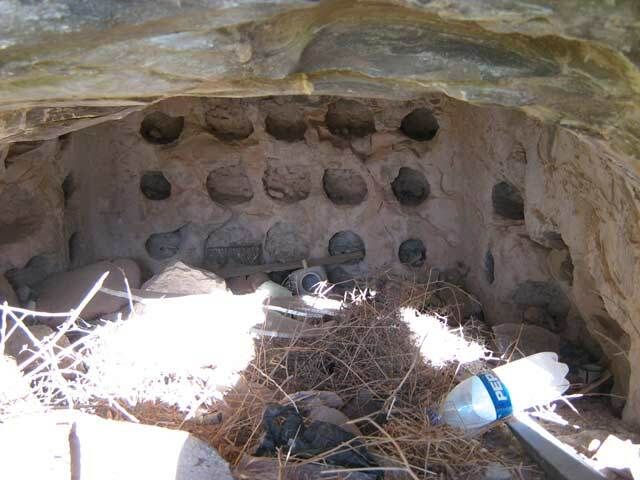 A rock shelter (Site 10, length c. 10 m) was also found. Cave 6 (Fig. 3) was documented in detail. It was meticulously hewn in the indigenous limestone, using a combed chisel. This is a large burial complex with an intricate plan. It seems that the cave had several entrances. 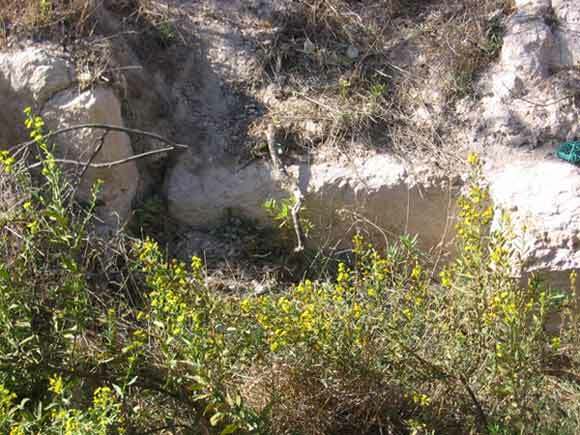 It was recently plundered but some of the objects were left in place and it is presumed that other artifacts are still buried in the layer of alluvium and fill (thickness c. 0.5 m). The central entry opens unto a rectangular antechamber (Fig. 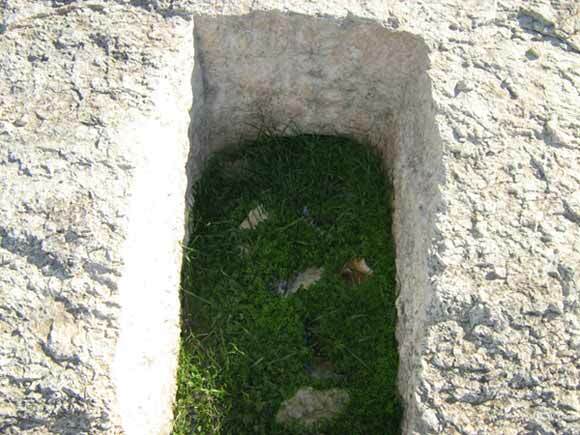 3:2) that leads into the main burial chamber (Fig. 3:3). Arched doorways (width c. 0.5 m) in the walls of Hall 3 lead to four hewn tunnels, two in each of the side walls, which lead to adjacent chambers/halls that were not surveyed. Two large corridor openings, rectangular and provided with sunken doorframes that are intended for closing stones (Fig. 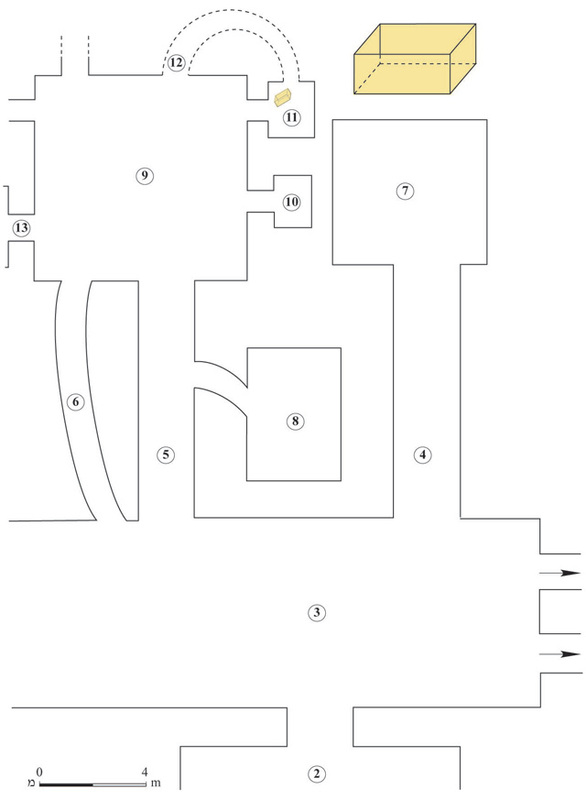 3:4, 5), are cut in the western wall of Hall 3, opposite the entrance; they lead to Chambers 7 and 9 (Fig. 3:7, 9). A small opening (Fig. 3:6), hewn next to Corridor 5, served as another passage or was a later breach in the side. The northern Corridor 4 (0.5×1.9×0.8 m) leads to the rear Chamber 7 (1.08×1.16 m); human bones were found scattered in both of them. 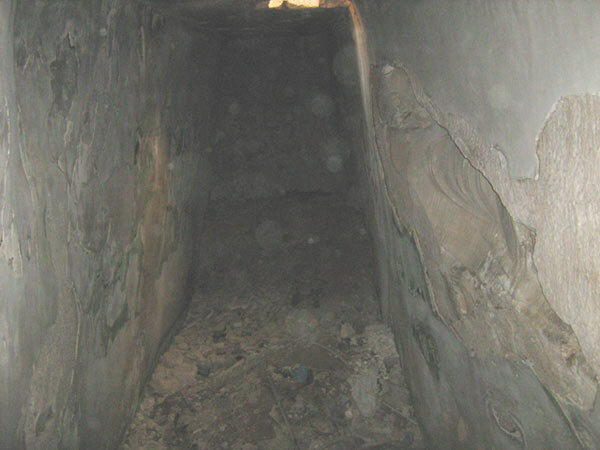 The southern Corridor 5, which leads to the rectangular Chamber 9, has an opening in its northern wall leading to a small rectangular chamber (Fig. 3:8) that served as a secondary burial room in which scattered human bones were found. Rectangular Hall 9 is spacious and the craftsmanship of its quarrying is excellent. Loculi and bone repositories are hewn in its walls, two on each side. One of them (11) contained an undecorated ossuary (0.31×0.72×0.31 m; Fig. 4) of soft limestone that was lying on its side with its contents was spilled. A limestone slab, found next to Loculus 13, was used to seal it. An opening north of the cave’s main entrance leads to another complex that includes a square antechamber, with a hewn standing pit in its middle and a heap of large stones in its northeastern corner, whose purpose is unclear. Branching off from this chamber are other chambers with loculi where at least two ossuary lids and closing slabs were found. Quarries and Rock-cuttings. The remains of twenty ancient quarries (Sites 4, 7, 8, 13, 16, 20–24 [Fig. 5], 27, 29, 30, 33, 35, 37–39, 42, 45) were discovered in bedrock outcrops throughout the area. Various size building stones were hewn in the quarries, which are spread across large areas and most of them are terraced. Quarry 27 extended across a much larger area than the rest of the quarries in the survey. Caves and installations were also found on the natural cliff in one of the quarrying regions (Site 38). Rock-hewn Installations. 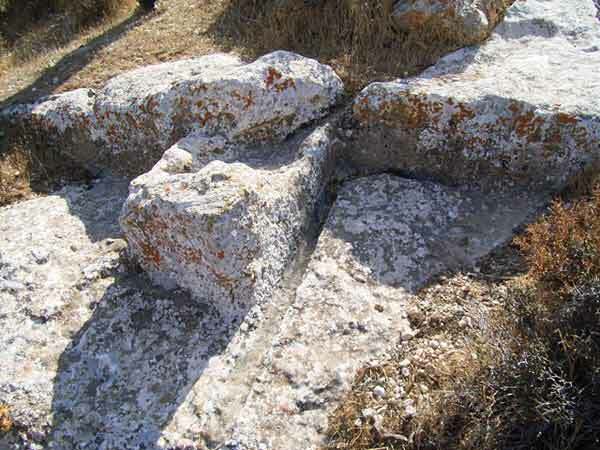 A hewn winepress, consisting of a treading floor and two round collecting vats (Site 9), was found, as well as two hewn installations, whose function is unclear (Sites 18, 31). Builing Remains. A relatively meager amount of building remains, including two terraces (Sites 32, 44) along the ravine that were preserved only one or two courses high and a dam (Site 43), was discovered. A stone clearance heap (Site 41) was discerned next to the terraces. 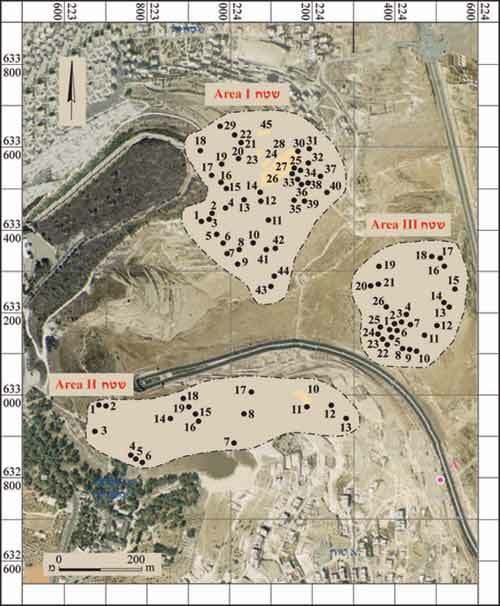 The area extends along the northern slope of the Mount of Olives ridge and twenty new sites were identified. Potsherds dating to the Byzantine period were found on the surface. Caves. Nine caves were documented; some are burial caves (Sites 1, 10–12, 19) and some—cave dwellings (Sites 5 [Fig. 6], 6, 13, 17). Quarries and Rock-cuttings. Remains of eight ancient quarries were discovered, in which building stones in a variety of sizes were hewn (Sites 0, 4, 8, 9, 14–16 [Fig. 7], 18). Other Installations. These include an active bedrock-hewn cistern with a rectangular and profiled opening (Site 2); four terrace walls, aligned southeast-northwest and preserved two–three courses high, are built of roughly worked fieldstones (Site 3); and a rectangular rock-hewn basin (0.52×0.97 m) that was probably used as a small cist grave (Site 7). Horbat Ras Tammim. The site is situated on a hilltop (Spot Height 704), east of the Mount of Olives. The area at the top of the hill is cultivated farmland, whereas the slopes are covered with vegetation. Potsherds, mostly dating to the Iron Age and the Early Roman and Byzantine periods, were found within the precincts of the ruin. Twenty-one sites were identified. Burial Caves and Tombs. Eight rock-hewn caves, probably used for burial (Sites 2, 3, 5–8, 17, 18, 25, 26), and one hewn cist grave, were documented (Site 4; Fig. 8). Cave Dwellings. Four natural caves that may have been used as dwellings were found (Sites 13, 21, 22, 23). Quarries and Rock-cuttings. Remains of quarries were found primarily on the southern part of the hill (Sites 12, 15, 16, 24) and two modern quarries (Sites 19, 20) were also discerned. Cisterns. Three large cisterns were documented (Sites 9, 10; one cistern has two openings; Figs. 9, 10).The plaster applied to their sides indicates they were probably hewn in the Second Temple period. Columbarium Cave. A rectangular columbarium cave (Site 1; Fig. 11), equipped with three rows of niches hewn in its western, northern and eastern walls, was surveyed on the southern slope of the hill. An ancient terrace wall, oriented southwest-northeast (Site 0), was documented. The surveyed area on the slopes probably served as part of the Jerusalem necropolis and as a region for stone quarrying from the time of the Second Temple and probably through the Byzantine period. The settlement remains at Horbat Ras Tammim (cisterns and a columbarium cave) apparently had their beginnings in the Iron Age and continued in later periods, at least until the Byzantine period. 1. General map of the area. 2. Area I, Site 19, a hewn opening of a burial cave. 3. Area I, Site 6, plan. 4. 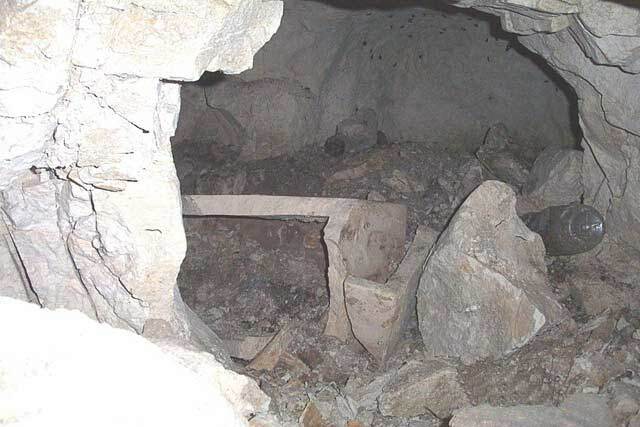 Area I, Site 6, an ossuary inside a burial cave. 5. Area I, Site 24, a quarry. 6. Area II, Site 5, a bell-shaped cave. 7. Area II, Site 15, a quarry with building stones that had not been detached. 8. Area III, Site 4, cist grave. 9. Area III, Sites 9, 10, one of the cistern’s openings. 10. Area III, Sites 9, 10, the inside of the cistern. 11. Area III, Site 1, columbarium.